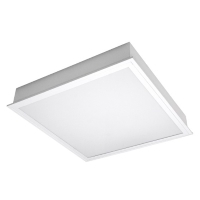 This dimming LED troffer fixture from TCP Lighting are energy efficient, consuming 25 watts of energy (up to 39% less than fluorescent fixtures) and has a brilliant light output. This high efficiency fixture provides a suitable alternative to the less energy efficient T12 and T8 linear fluorescent troffers. The long 50,000 hour rating makes these fixtures perfect for use in applications that require long life and low maintenance, such as in hospitals, office buildings, lobbies, restaurants, schools. retail stores, and in any grid ceiling. They are available in 3000K (Warm White), 3500K (Soft White), 4100K (Cool White), and 5000K (Daylight White) colors. The LED technology allows for mercury-free, low heat use with exceptional color consistency. An even glow is distributed through the use of the opaque lens.